Khan Academy video: "The Law Code Stele of King Hammurabi"
Constitutional Rights Foundation article: "The Hebrews and the Foundation of Western Law"
"Mesopotamia: Crash Course World History #3"
"The Epic of Gilgamesh: Crash Course Mythology #26"
A. Study questions for the "Epic of Gilgamesh"
1. What is Gilgamesh's position in society? 2. Who are the parents of Gilgamesh? 3. Describe Gilgamesh's behavior at the beginning of the story. 4. Who is Enkidu and what purpose does he serve in the story? 5. What changes does Enkidu undergo before he meets with Gilgamesh? 6. What is the nature of the relationship between Enkidu and Gilgamesh? Why do they go on a quest? 7. What do Enkidu and Gilgamesh do that insults Ishtar? 8. What purpose does Enkidu's death serve in the story? 9. Why does Gilgamesh react to Enkidu's death the way that he does? 11. Why do the gods send the Flood and why does Utnapishtim escape? 13. What counsel does Utnapishtim give to Gilgamesh? 14. How does Gilgamesh lose the rejuvenating plant? 15. How does Gilgamesh react to losing the plant? 16. What purpose does losing the plant serve in resolving the basic conflict presented in the story? 17. What has Gilgamesh learned from his quest (the story's theme)? 1. First discuss your reactions to the clauses in general. 2. Next choose two clauses that your group finds particularly interesting and/or important for stable life within a community. Discuss the significance of those clauses and try to determine the reasoning behind them: for what purpose are they designed? 3. Are the clauses just according to today's standards of justice in the communities with which you're familiar? Explain. "The Egyptian Book of the Dead: A guidebook for the underworld"
1. Who was Ma'at? What concept did she represent? 2. What was the main purpose of a Book of the Dead? 3. What was the weighing of the heart ceremony? What is its significance? 5. According to the Negative Confessions, what kinds of actions did the Egyptians consider inappropriate? 6. Consider each confession as a law with a purpose. What is that purpose? 7. Next consider what would motivate citizens to follow this code of behavior. morality with which you are familiar? Small group activity: Consult your textbook to respond to the following questions. 1. What are the Vedas? 2. What is the Mahabharata? 3. What are the Upanishads? 4. What does the term "pantheism" mean? 5. What is the difference between Brahman and Atman? 6. What is the law of Karma? A. Review Reading 3.1, discussing passages that are unclear to members of your group. enlightenment, according to Krishna?" Cite specific lines from Reading 3.1 to support your responses. Hammurabi's Code, the Decalogue, and the Egyptian Negative Confessions. 2. Think of a specific situation we encounter in daily life that requires a choice of action. food, but there it is in the fridge, wrapped up and labeled. What do you do? Explain your reasoning. 3. Identify the actions available to you. Do any of them represent an extreme (a vice)? If so, what vice(s)? 4. Identify the mean: What is the best course of action for the circumstances and the individual(s) involved. individual(s) involved in the situation. 1. 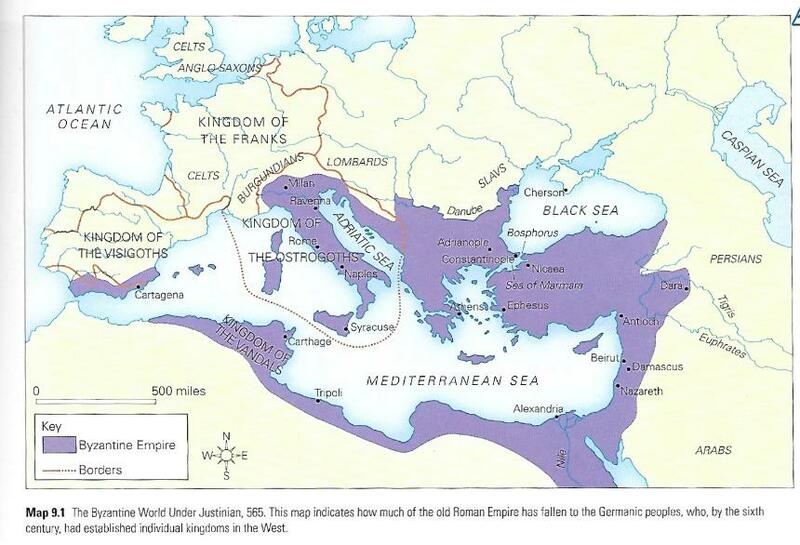 Explain why the Romans were so successful in building and maintaining such a large empire for so long. 2. How did Gaius Julius Caesar bring stability back to Rome? 3. Identify 2 significant points concerning Roman law. 4. What is the Pantheon? 1. Who was the founder of Stoicism? 2. What are the Stoic virtues? 3. What is at the core of Stoicism? of Mind." Then respond to the questions below. 1. Seneca states that it is necessary to correctly assess our character, our strengths and our weaknesses. Why? 2. Seneca also states that it is essential to correctly assess those with whom we interact. Why? 3. What qualities does Seneca suggest we seek in our friends? 4. Seneca and Stoics in general maintain that one's disciplined use of a very specific human capacity is vital to one's peace of mind. What is that capacity? 5. Is Seneca's Stoic philosophy anchored in the past, the present, or the future? Explain. 6. What specifically does Seneca name as the "greatest source of affliction to humanity"? Why? example where this distinction can be usefully applied. Share your example with the class. Pop philosopher Alain de Botton: "Seneca on Anger"
Massimo Pigliucci's TEDx Athens talk, "Stoicism as a philosophy for an ordinary life"
1. What do you consider to be a sacred space? 2. Why do humans create sacred spaces? 3. Identify several sacred spaces that you've visited or know about. 4. What feelings did you experience there? 5. What factors contributed towards those feelings? 1. What three different cultural traditions set the stage for the rise of Christianity? 2. Identify the religious belief systems that Jesus and Siddhartha Gautama reformed. 3. Discuss your short writing response to one of the questions on page 195 of Fiero's textbook (7th ed.). 4. In the context of Buddhism, what are the Four Noble Truths? 5. In the context of Buddhism, what is the "middle way"? 6. Which belief system focuses on human perfection and immortality? 7. Identify the goal of the other belief system (it's not immortality). 8. Describe the distinguishing features of a Buddhist stupa. 1. What is Hagia Sophia? 2. Where is Hagia Sophia? 3. When was Hagia Sophia built? 5. What is the greatest geological threat to Hagia Sophia? 6. What cultural threats have impacted Hagia Sophia? 7. What is the purpose of the windows in the second dome designed and constructed for Hagia Sophia? 8. What religious groups have worshipped in Hagia Sophia? 9. What is Hagia Sophia's function today? 10. What is the purpose of the thin gold leafing in the mosaics? 11. What is the purpose of building a model of Hagia Sophia? interior? Justify your response by referring to specifics (of the building). and self-proclaimed representative of the Christian God. Crash Course History of Science: "The Medieval Islamicate World"
significance of this event. Studying the map on page 227 may help your analysis. B. Turn to page 235. What does the term "Islamic" indicate? Video: What's the difference between "Islamist" or "Islamic"? When your list is complete, discuss the impact of these contributions to the humanistic tradition. Mosque: the term for a Muslim place of worship. Arabia, considered by Muslims to be the holiest city of Islam. are expected to make this trip at least once during their lifetime. worldwide are supposed to face in the direction of the Kaaba during prayer. mosque by the position of the mihrab. Muezzin: The muezzin is a man who calls Muslims to prayer from the minaret of a mosque. Read about the Great Mosque of Kairouan here (not required reading). Read about the Great Mosque of Córdoba here (not required reading). Read about the Great Mosque of Isfahan here (not required reading). 1. Based on the images we've seen, what features do mosques typically have in common? Personal Reflection Question: What types of natural and architectural spaces do you find inspirational? Why? Architecture Now article (2017): "Sacred Spaces"
What role do light and space serve in sacred spaces? Cite specific examples to support your ideas. You may prefer to discuss public places instead of sacred spaces. Use specific examples. Divide into 4 groups to discuss the following points and questions about the Middle Ages (circa 500-1450 CE). 1. Why is it inaccurate to refer to the Middle Ages as the "dark ages"? 2. Identify the 3 traditions that together produced a new culture. 3. What similarities did Germanic law have with Hammurabi's Code from ancient Mesopotamia? 4. What do Beowulf and the Song of Roland have in common? Listen to an excerpt from Beowulf in Old English here. 6. Identify several of Charlemagne's notable accomplishments. 7. Briefly explain the feudal contract between lord and vassal. 8. What does the term chevalier mean? 9. What role did women play in feudal society? 10. What is a chanson de geste? 11. What was the Norman Conquest and when did it take place? 12 What is the Bayeux tapestry? 13. What was the Magna Carta signed and what was its significance? 14. Describe the lives of medieval serfs. 15. What were the Christian Crusades? 16. Did Charlemagne fight in the Christian Crusades? Give facts supporting your response. system, develop a list of pros and cons of this type of social arrangement. 1. What type of literature is the Song of Roland? 2. When did the historical event happen? 3. When was the Song of Roland composed? 4. Who are the principle characters in the story? 5. What two groups oppose each other in the Song of Roland? 6. The representation of the conflict is not historically accurate. Propose reasons for the inaccuracies. 7. What are the main points of the story (what happens)? 8. What is the disagreement between Roland and Oliver? 9. Why does Roland refuse to call for help on his Olifant (horn)? 10. What do you think about Oliver's and Roland’s decisions? Would you have acted differently? Explain. the ideal knight (a balance between the characteristics of Roland and those of Oliver). 2. What does the text reveal about Christian attitudes towards Muslims (Saracens) during the Middle Ages? Are the Saracens capable of doing good or are they portrayed as totally evil? 3. How did the Franks (Christians) view their relation to God in the Song of Roland? 4. Read Roland's death scene carefully - what causes his death? 5. Does Turpin fit your image of a Catholic archbishop? Explain. 6. What role does religion play in this excerpt from the epic poem? Chapter 13: "Medieval Synthesis in the Arts"
What does the chapter title mean? emerged in Western Europe in the early 11th century. 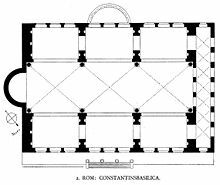 was characterized by rounded arches; thick walls, vaults, and columns. lasted until the advent of Gothic architecture in the middle of the 12th century. Early Romanesque ceilings and roofs were often made of wood. 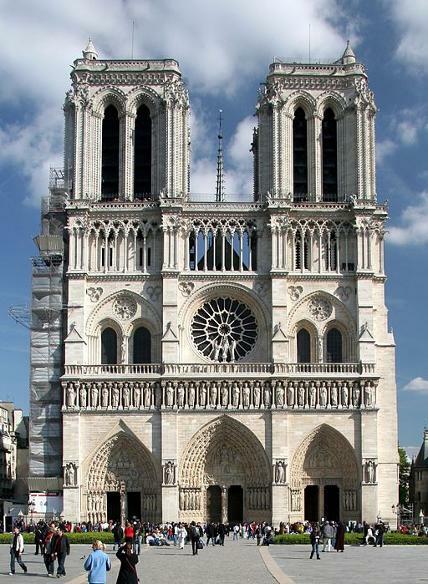 was characterized by: stone structures, large expanses of glass, clustered columns, sharply pointed spires, intricate sculptures, pointed arches, ribbed vaults, and flying buttresses. edition of the book you're using as a reference. 1. 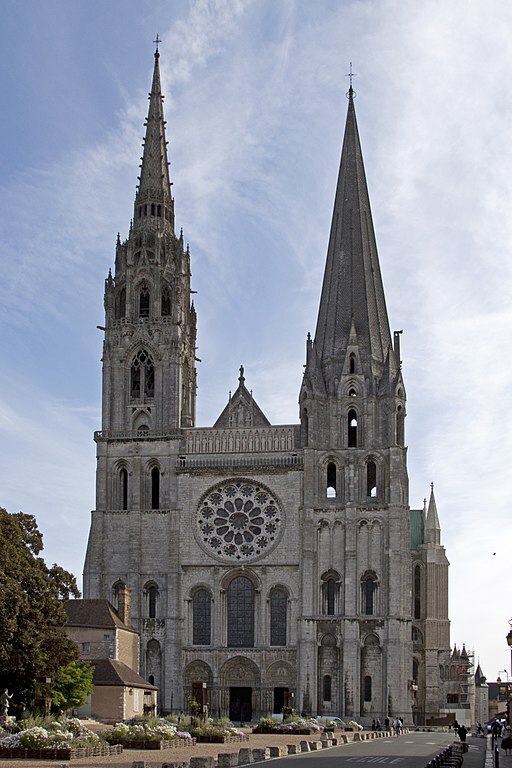 Which of the following is not true about the Cathedral of Notre Dame de Chartres? a. 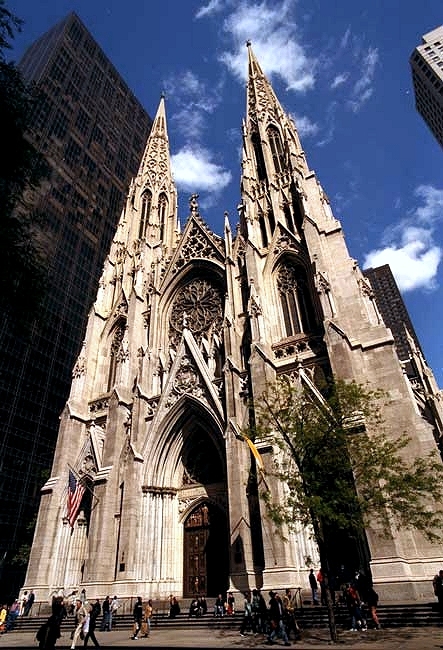 The Gothic features of the cathedral emphasized the idea that the building was a divine space. b. Gothic architects tried to maximize the space for stained glass windows. The development of rib vaults and flying buttresses made this easier. c. An important symbol in this church is the light, which was considered as a symbol of divine presence. d. The architect used rounded arches, thick walls, and massive piers to support the weight of the building internally. 2. 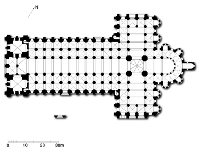 What is the basic, symbolic shape of a Gothic cathedral? 3. Pointed arches, flying buttresses, and rib vaults are all features of Gothic architecture. What did these features allow architects to do? You can read the Diary of Murasaki Shikibu here. You can listen to Murasaki Shikibu's Tale of Genji on LibriVox (not required for this course). Create a chart comparing the European and Japanese feudal systems; include both similarities and differences. lived. Also: identify the contributions made by those 4 people. 2. Identify 2 factors that contributed to the spread of Christianity. 4. Identify 2-3 similarities between Islamic mosques and Christian cathedrals. 5. Identify 2-3 differences between Islamic mosques and Christian cathedrals. 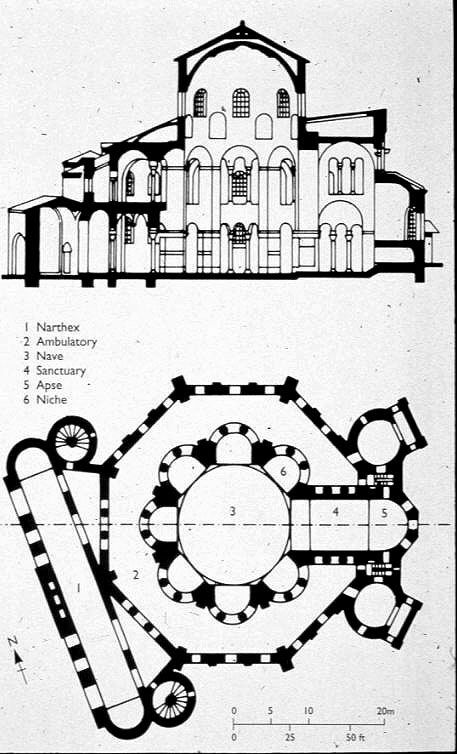 Gothic cathedral referenced in this rubric. 7. Explain how the Song of Roland represents the medieval European feudal system. 8. Identify 3 scientific or technological contributions made by Islamic or Arab civilizations. 10. The teachings of the Buddha, Jesus, and Muhammed share some common points. Identify at least 2.
the exam study guide posted on Canvas for this activity! When everyone is ready, each group will challenge the other groups to respond to their questions. 1. How does literature reflect culture? 2. How can literature shape culture? wrote? Refer to specific quotations from the reading to support your response(s). and wrote? Refer to specific quotations from the reading to support your response(s). 1. During the European Middle Ages, is the focus on humankind or on a divine external force? 3. Where is the focus in the Buddhist, Islamic, and Confucian belief systems we've considered? 4. Why is it important to learn about context when studying different aspects of a culture? 5. What influences our perception and understanding of a culture? 1. Marinella divides the false, slanderous accusations made against women into 2 categories. What are they? 2. Why won't Marinella respond to arguments based on "specious reasonings"? 3. How does Marinella explain the errors that intelligent, educated men make about women? 4. Identify the passage in the reading that discusses invalid, inductive reasoning. through Films on Demand via the WCC Library website. In the search box, type Machievelli: The Prince. To explore more about linear perspective, check out this video: "Understanding Linear Perspective"
at the top of the page. Identify the artist, medium, and the time periods represented. images, colors, shapes, lines, etc. 4. Examine the clothing of each of the figures in the fresco. Which figures (people) appear more than once? Consider possible reasons for those repetitions. composition and line, shape, color, focal areas, balance and perspective. the moment just seconds after Jesus explained to his disciples that one of them would betray him. the painting as they react to the announcement of the central figure, Jesus. 6. Share your group's theme statement with the rest of the class. 2. Now turn to page 423 of our textbook and study Michelangelo's sculpture David. Describe this figure. 3. Compare the two sculptures of David. Which is more realistic? Explain your reasoning. 4. Which sculpture appeals to you more? Why? If neither sculpture appeals to you, explain why. "Mansa Musa and Islam in Africa"
The video is also available here. Explore more about the Sundiata here and here. Watch a performance of the Sunjata (Sundiata), with musical illustrations, here. Learn more about the Haudenosaunee Confederacy here (not required). 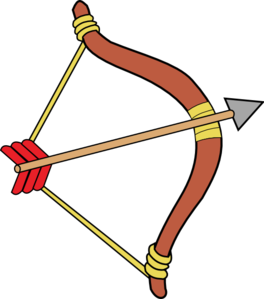 Learn about the Narragansett Indian Tribe here (not required). Watch "The Man, the Snake and the Fox" (not required). Watch April Charlo's "Indigenous Language Revitalization" (TEDxUMontana) here (not required). The Haudenosaunee Confederacy and "Hodadenon: the last one left and the chestnut tree"
1. Who are the Haudenosaunee? 2. What is a confederacy? 3. What is a participatory democracy? 4. What kind of constitution did the Haudenosaunee Confederacy originally have? 5. What are the three principles of the Great Law? 6. What do you think is the meaning of "the power of the good mind"? 8. How do you interpret the statement, "peace is a state of mind"? 9. Read together as a group the Haudenosaunee values and ethics. 10. Find examples of those values in the story, "Hodadenon: the last one left and the chestnut tree." mind" and its power. Be specific. 12. Re-read question 8 then cite other texts we've studied that treat this subject. Be specific. 1. What is the setting of the story? 2. Who are the characters in the story? 3. Hodadenon’s uncle makes sure his nephew is sleeping before he prepares dinner for himself. Why? What does this tell us about the uncle? mischievous, self-centered child to a responsable, engaged, and caring member of his clan. 1. What is the purpose of this documentary? 3. What is the significance of the Ko-kwal-alwoot story to the Samish people? 4. What is the significance of the family in Samish culture? 5. Why was the story pole created? Be specific. 6. Did a member of the Samish Indian Nation carve the story pole? 8. Why did so many Samish people move away from the region where they had lived for so long? 9. Who is Tracy Powell and what was his initial reaction when he first saw the log for the story pole? 10. Where is the story pole located? 11. What do the two sides of the story pole represent? specific references from the stories to support your ideas. inventions that defined the period in which Montaigne wrote. 2. Look up the definition of the term "barbarism." 3. Why does Montaigne trust the knowledge of the man he presents in the first paragraph of the reading? 4. What does Montaigne say about direct experience compared to conjecture? 5. What does Montaigne indicate about the word "barbarian"? 6. How does Montaigne contrast the "natural" world and the "civilized" world? compare it to certain European practices? argument and Christine de Pisan's?